ohoho its my boxing day wallpaper XD I made another wallpaper which was for my wallpaper website. This wallie features Daisuke Niwa from DN Angel. 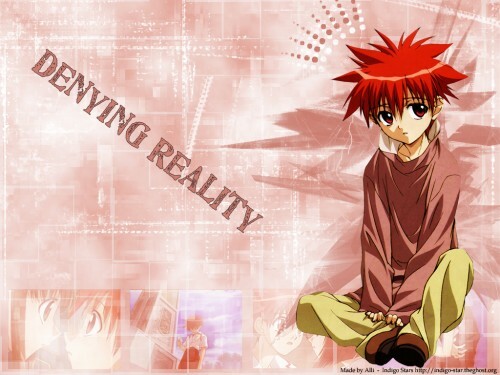 The name "Denying Reality" came from.... uh no idea sorry :hmpf: The wall reminded me of Daisuke being rejected my Risa, so I guess Denying Reality sorta fits in right? Very gentle and lovely ^_^ I love this tone color >_< Keep it up, Strawbert-san! Wow! very nice colours u chose^^ The scan goes with the bg too!Great work! Wow! Amazing! I love the colors..... and the character! I love Diasuke! He's sooo cute! Very nice! FAV! Very plain wallpaper.....and I can see some minor extraction probs..but it ish all very minor...nothing big ^^ The background although quite plain, but still adds a touch to the wall ^^ Keep it up! Like the simple design,but I think you can put more image in the bg.